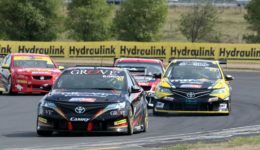 At just over the half way mark of the BNT V8s Championship, Class One rookie Chelsea Herbert is getting to grips with her Richards Team Motorsport MTF Finance Toyota Camry following a season best third overall finish at Teretonga recently. 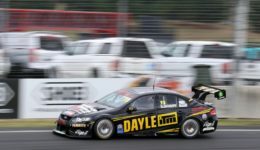 After a tough start to the season at Rounds One and Two at Pukekohe with some mechanical gremlins, Herbert says she’s starting to get on top of the car, and being able to extract the best performance out of the chassis. “The third round at Highlands was the one where I really started to gel with the car. Whatever I did, the car did it with me, not against me,” says Herbert. In race three of the weekend at Teretonga; Herbert followed home teammate Brenton Grove and winner Nick Herbert to the line mere fractions of a second behind. Herbert is also quick to praise her race engineer, Barry Neale, the pair working together for the first time this season. “It’s been great stepping into the Richards Motorsport Team this year, and working with my data engineer Barry Neale. “It’s been a huge learning curve for me, understanding all the data. It’s been a big highlight however, as now every time I come off the track I always have multiple aspects to work on for the next session myself – no more blaming the car as a whole. “It’s great because even when you feel like you’ve finally done a good lap or perfected a corner, Barry will have a look at the data with me and pull it all apart, and there’s always that extra tenth you need to find out there. You don’t fully realise the benefits of a data engineer until you’ve got one. Edging closer to the front-runners, Herbert says it’s the small increments she is now focussing on as she strives to achieve more regular podium finishes. 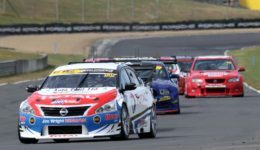 Round four of the BNT V8s Championship gets underway at Manfeild, Feb 8-10.